Even TMZ can’t escape the reign of the Kansas City King. Launching their annual Celeb Snapshot Contest, TMZ encouraged fans to submit their best photos with celebrities for a chance to win a full Hollywood vacation. One Technician known only as Emily submitted this candid snapshot with Tech N9ne. With over 900 submissions, Tech N9ne joined the likes of Adam Sandler, Rihanna, Mickey Rourke, and even Tim Tebow among celebrity snapshots. 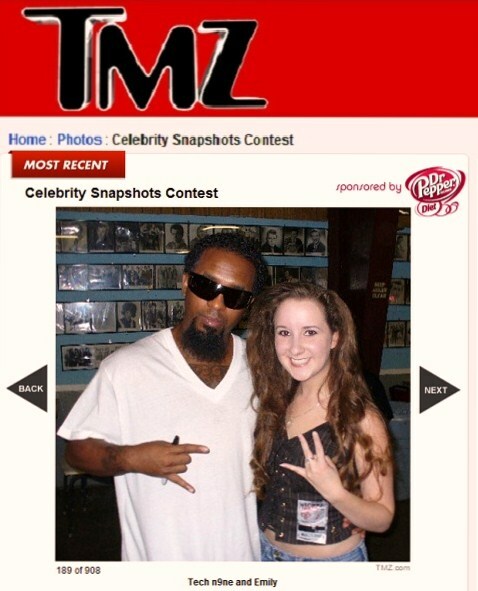 As Tech N9ne’s record breaking “Hostile Takeover 2012” Tour gears up to hit the road, perhaps next year we can expect to see more fan photos of Tech N9ne in the TMZ contest. Stay tuned for more! What did you think of the some of the submissions? Do you have any great photos with Tech N9ne?